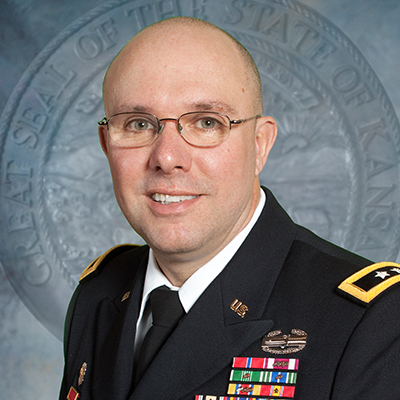 Major General Lee Tafanelli has served in the Kansas Army National Guard (KSARNG) for more than 30 years in numerous command and staff assignments, including deployment to Iraq during Operation Iraqi Freedom as a battalion commander. He also has been directly involved in the Guard’s emergency response to natural disasters. As the adjutant general, Maj. Gen. Tafanelli oversees the activities of the Adjutant General’s Department. This includes providing personnel administration and training guidance for over 7,700 soldiers and airmen in the Kansas Army and Air National Guard. As the director of Kansas Emergency Management, a division of the Department, he is guiding a small professional core of personnel that prepare for and respond to disasters. In addition to the part-time soldiers and airmen, the Department he leads includes about 2,300 full-time State and Federal employees. Additionally, 105 county emergency managers and their staff receive guidance and training through the Department. Major General Tafanelli is also the Director of Homeland Security for Kansas, where he works to ensure security in the state is a top priority. For budgetary and administrative purposes, he is responsible for the Civil Air Patrol.